I have to confess I have never painted a portrait… just seemed too difficult and therefore scary to attempt. 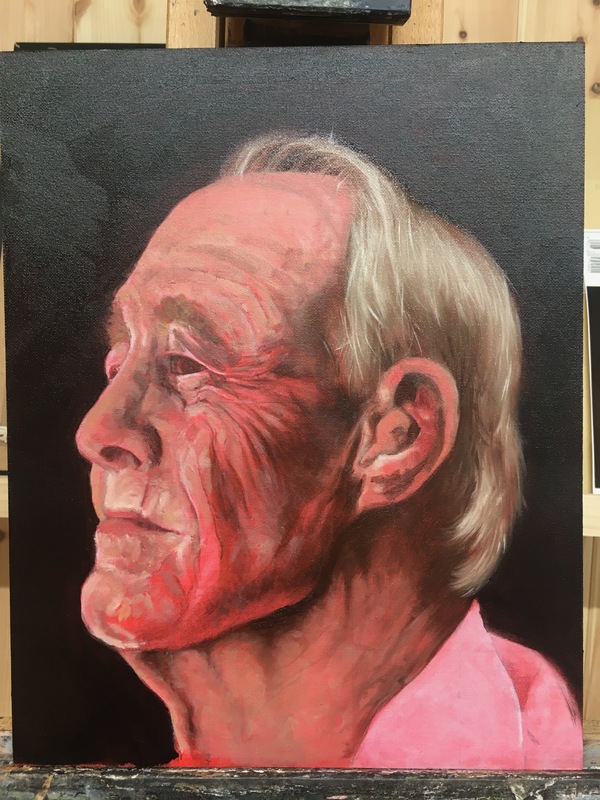 So, to get over this fear, and hopefully pic up the skills required to get commissions, I embarked on a weekends Portrait Painting with Oils workshop with the extremely talented artist Mike Skidmore, based in Ross-on-Wye. 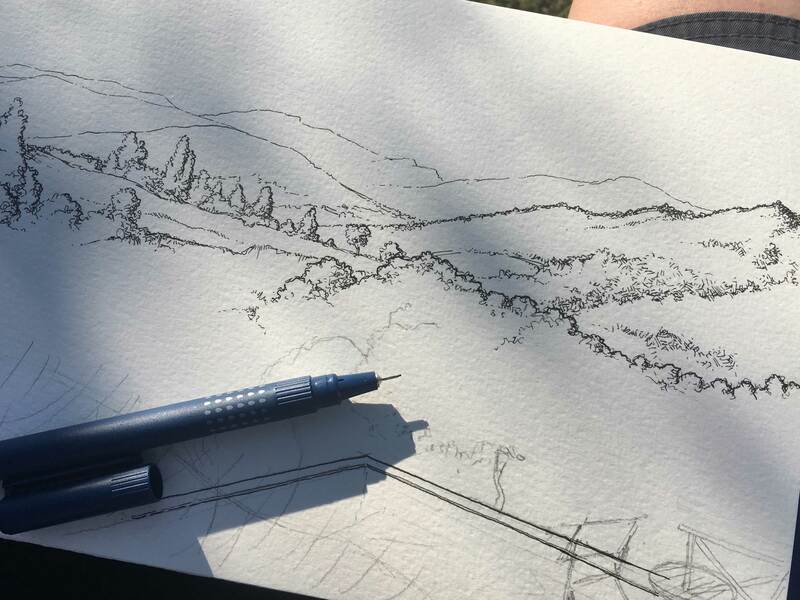 The initial sketch was created from a photograph supplied and we were shown how to create a grid using key points as reference, such as the centre of eyes, edge of ears, depth of nose and width of mouth. I haven’t used this system before so was a bit sceptical, but bloody hell it works. Really important stage in getting the features in correct proportions, so important in capturing a likeness. On top of this was created an underpainting in acrylic. Oils could be used at this stage but acrylics are so much faster. 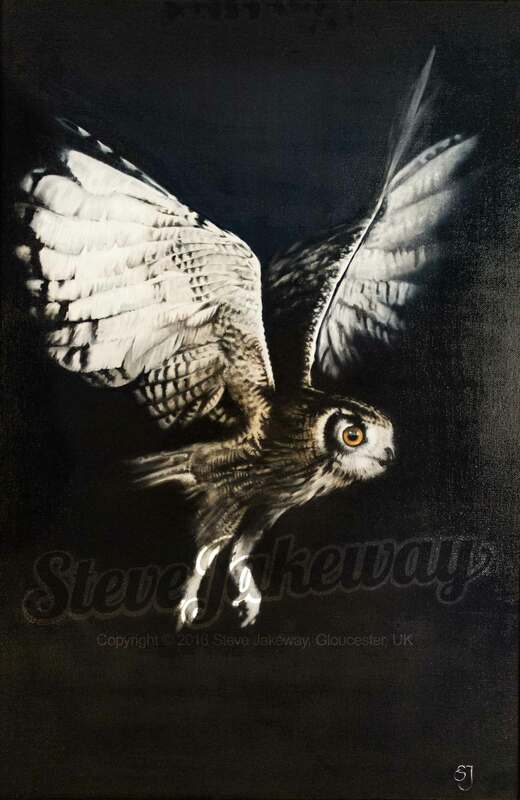 The aim of the underpainting is to first seal the pencil work with an overall thin wash of colour, then, using only monotone, study the subject to define the main blocks of shadow and highlight. Building up structure in this way is the same as creating many studies before starting a work, but achieving the same aim (working out the subjects features and character) on the canvas. This stage can be likened to creating a sculpture where one starts by defining the rough shape, facets and angles before applying any detail. The oil painting then uses paint very tentatively to build up the structure in colour, textures and detail in many layers. 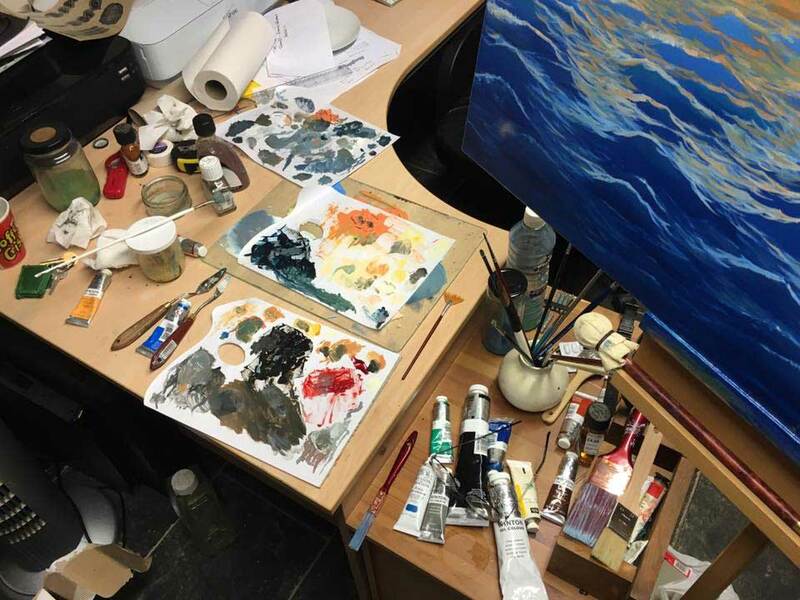 The underpainting can still be seen in the initial stages of this process but as layers build up the painting develops, and the portrait starts to come to life. Interestingly Mike follows the same process as I do with my wildlife work and leaves the eye till last. Putting this in too soon finishes the painting where other parts are still incomplete! Finally the painting can be colour and tone corrected once touch dry by glazing and scumbling. 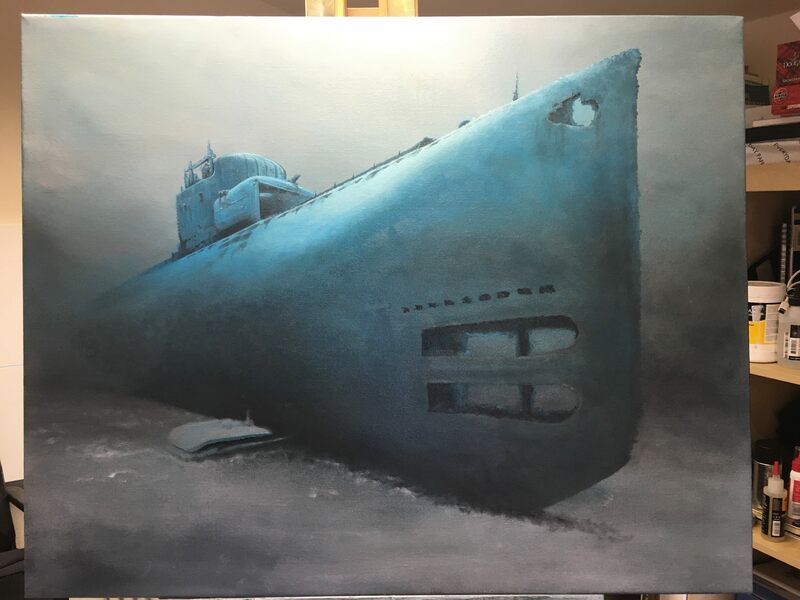 I didn’t get to complete the painting but was chuffed at how much I did achieve in just two days… I am usually a slow painter, unable to work more than an hour or two at a time, so now hope I will be quicker with future work. Brilliant course, would thoroughly recommend and is definitely suitable for all levels of skill… Mike makes sure everyone goes away with a sense of achievement. M2 Commission getting there… slowly! This work has been a challenge as have not done anything like it before. 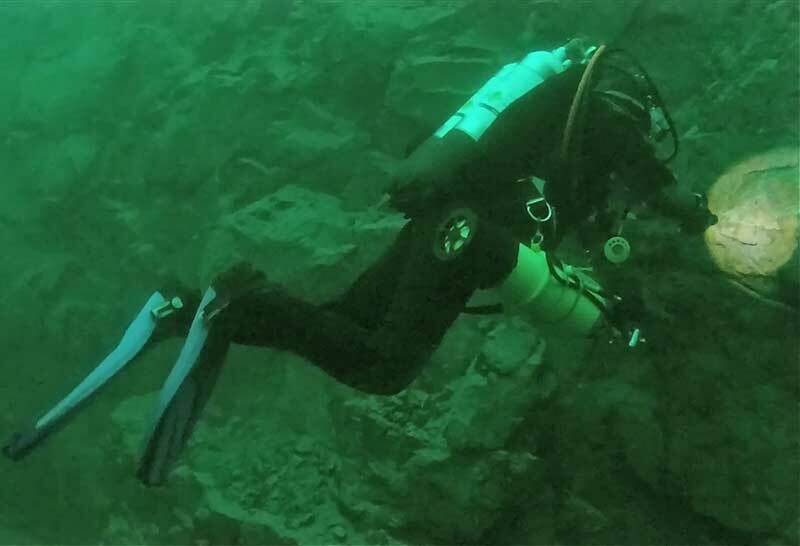 Trying to capture the current condition of the wreck, the undersea colour and light, the sense of exploration by divers, the focus of the painting and composition – all fluid and have changed direction and thoughts several times in the process of the work. However, I now feel it coming together and need to push now to get it finished. Like the ‘Eagle owl painting, I enjoy working with a limited pallet. Allows me to concentrate on the light, composition and detail more effectively than painting a scene with a wide range of colours to capture. Have just returned from a trip to Italy where I spent an amazing week in Umbria, with a quick trip over the border to Tuscany too. We stayed in the beautiful Villa Bastiola in the mountains with stunning views. I didn’t get much chance to sketch but did get plenty of reference and inspiration. 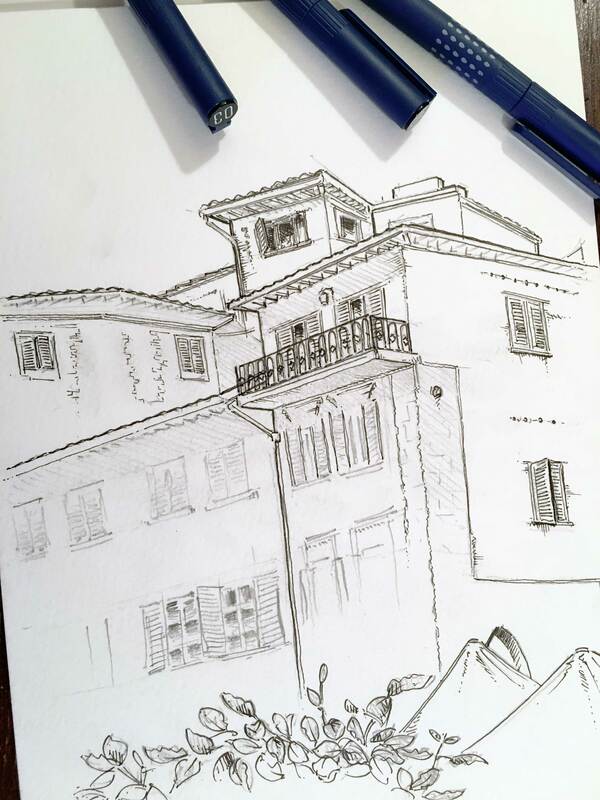 I did sit down at a bar table in La Bucaccia in Cortona, Tuscany one afternoon and dabbled at a sketch of the architecture that overlooks the square. Was out of my comfort zone here with bunches of people watching me work over my shoulder, but this is something I want to get over, so plan to do more of this sort of thing. I did take some watercolours with me too but didn’t use them. Instead, I plan to finish these off back in the studio. Apart from painting, I have produced several commercial illustrations recently. 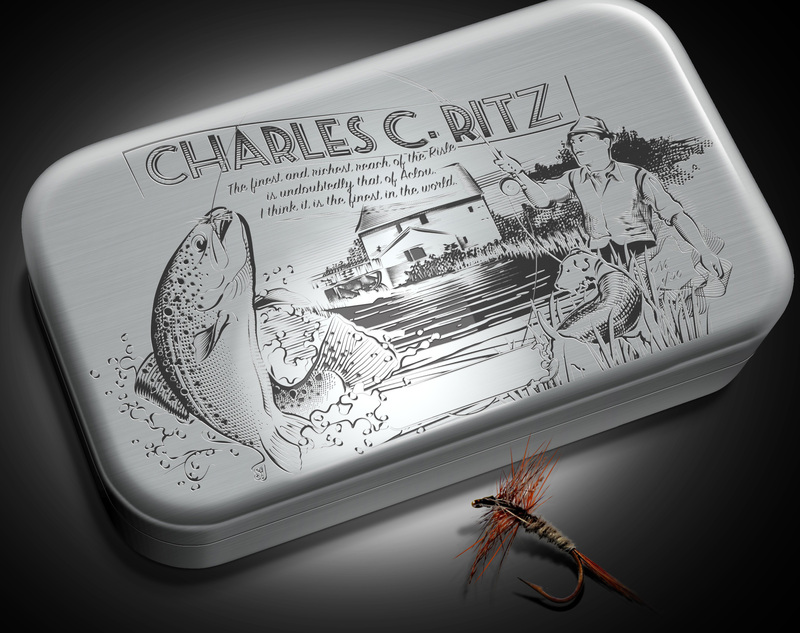 Using Adobe Illustrator I have created a number of custom brushes to help me achieve an engraving style which was used for a limited edition tin of original pattern trout flies, depicting Charles Ritz at his favourite spot, the ‘mill of Aclou’ on the river Risle. I used the same style to create the branding for ‘Heritage Flies’. Well that’s the GSA annual exhibition at Painswick done. Didn’t sell any of my original art but a few of my greeting cards went… covered my mileage costs if nothing else! Not forgetting of course that my painting ‘out of the inky black’ was awarded the ‘Presidents Cup’… Awesome. I collected my work this afternoon and now have them back safe in my studio. Next thing to do is get high quality photos shot so I can get limited edition giclée prints done. These will be available soon, personally signed and numbered and will come mounted (not framed) with a certificate and wrapped in cellophane. Will go to any depths to get painting reference! Thank you for allowing me the privilege of this award… right chuffed I am.